On February 4, 1974, members of the Symbionese Liberation Army kidnapped nineteen-year-old newspaper heiress Patricia Hearst from her Berkeley, California apartment. Desperate to find her, the police called physicist Russell Targ and Pat Price, a psychic retired police commissioner. As Price turned the pages of the police mug book filled with hundreds of photos, suddenly he pointed to one of them and announced, “That’s the ringleader.” The man was Donald DeFreeze, who was indeed subsequently so identified. Price also described the type and location of the kidnap car, enabling the police to find it within minutes. That remarkable event is one reason Targ believes in ESP. Another occurred when his group made $120,000 by forecasting for nine weeks in a row the changes in the silver-commodity futures market. Russell Targ on Coast to Coast Radio! Russell Targ Documentary Coming Soon! Watch the Trailer Now! 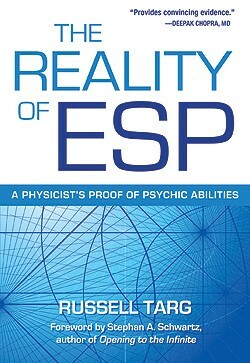 The Reality of ESP: A Physicist's Proof of Psychic Abilities author Russell Targ is being featured in an upcoming documentary called Third Eye Spies. Watch the HD trailer now! The Reality of ESP author Russell Targ will soon be featured in a documentary about the events covered in the book. Read below for details about Third Eye Spies.